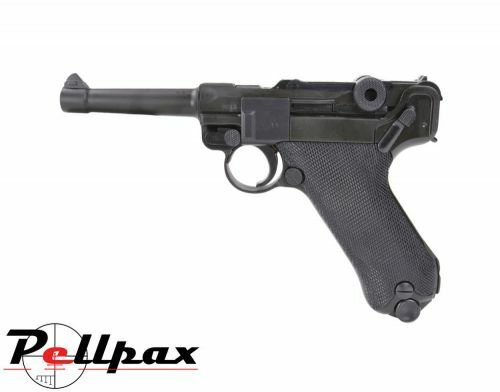 The accurate air pistol replica of the original Walther P08 Luger utilises 12g CO2 capsules to power its semi automatic, non blowback action. By being non blowback, this pistol becomes near recoiless and makes shooting accurately much easier as there is no violent recoil. The P08 Luger is one of those classic designs that has endured the test of time and is still widely recognised around the world today thanks to its prevalence in WWII. Made in Germany by Umarex, this pistol is very reliable and will provide many hours of shooting enjoyment. Add this item to your basket & spend an extra £411.01 to apply for finance.